Fetch you Brazilian joy of living in your home - the colourful hammocks are an eye-catcher for each garden or terrace! Fixed on the ceiling, on a beam or outdoor on a tree the hammock chair is also a good place for relaxing and recreation. 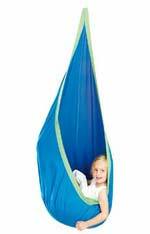 The integrated swivel give safety to playing children, if they turning around themselves in the hammock chair. There's nothing like the outdoors, enjoying nature, beach, hiking or even up in the mountains - what ever you do, a hammock should be part of your equipment. Outdoor hammocks, camping hammocks or swings take up so little space, just as a travel hammock for your trip. Babies between 0 to 18 months are cradled to a peaceful slumber with an adjustable baby-hammock - perfect for the baby's needs. If you like the Mexican hammock culture, nothing equals the exquisite pleasure of lying in a Mexican net hammock. The net gives a wonderful airy floating sensation - simply perfect for a hot summer! give you independence from location - we offer adjustable wooden and metallic hammock stands. Cushions just as utility-bags or foot rests - you find everything to make rocking even more comfortable. We offer also a full range of fixing sets, consisting of hardware, ropes or chains, to meet all conceivable fixing requirements. All hammocks and hammock chairs are delivered in cotton bags matching the product's fabric. We ship in whole Europe - our English website is in process of development.